The youth peer leadership program of Boston’s Allston-Brighton Substance Abuse Task Force participates each year in the national “Above the Influence (ATI)” campaign. The campaign helps young people identify the things that help them stay true to themselves and above negative influences. For the last few years Connection Lab has helped the peer leaders develop and carey out ATI projects. 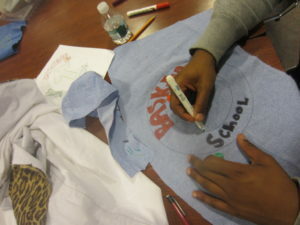 The first project was a large quilt that the group collaboratively sewed. 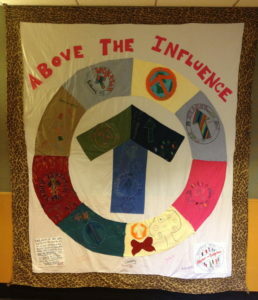 Each person decorated one section of the quilt with words and images representing the parts of their life that keep them above the influence, and then they sewed all of the pieces together into a much larger ATI symbol. The quilt was displayed at a variety of public spaces including the High School and the library.